Ghaziabad - Masoori - Pilakuan = Horrible, due to various diversions because of Delhi-Meerut Expressway. Start early to avoid traffic mess. However, For this only patch, you need Luck. Planning to do a road trip from Delhi to Doon n Chandigarh. Will take the Karnal-Ladwa-Y.nagar-Paonta Sahib route for Doon. I require suggestions for Doon-Chd road trip. Which should be the better route from Doon-Chandigarh... is the road condition of usual Shimla bypass road-Nahan-Kala Amb NH7 doable or another route is preferred? Route Via Kala Amb and Narayangarh is fine. Nahan to Paonta Sahib was good. Ponta to doon is all broken. If you are hitting the road during peak hrs then stick with Paonta Sahib, Nahan, Naraingarh, Raipur Rani road. From doon to paonta, there are two routes. One is via herbetpur and another is via old Shimla road or jungle Wala road as locals call it. Former is full of local traffic and latter is with minimal traffic through villages with speed breaker every few hundred meters around villages, if I remember correctly. Thanks for reply... Is the Paonta sahib-Chandigarh NH full of hilly terrain ? I have driven in hills.. Doon to Mussoorie only, not much. Also, is the road narrow i.e. single lane or its a good enough highway? Is the Paonta sahib-Chandigarh NH full of hilly terrain ? Also, is the road narrow i.e. single lane or its a good enough highway? Road is wide enough for a car / Bus. Don't worry as there will not be much traffic in summers. It's almost flat gradient all the way to nahan. Around nahan, hilly sections are there but not something a delhi driver can't handle and road is typical single lane hill road. From there, you get butter smooth 4 lane proper highway road to Chandigarh, though there are few diversions. This year Hemkunt Sahib Yatra will start from 1st June 2019 due to more snow on the route. Adhik barf padi hone ke karan. 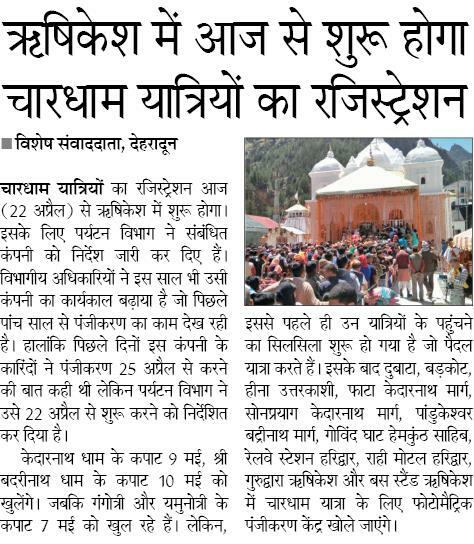 Photometric Registration will start from 22 April 2019 at Rishikesh and and at main points for Chardham Yatra. Find all the latest news in Hindi, Breaking Hindi News from across world on Navbharat Times ePaper Online..